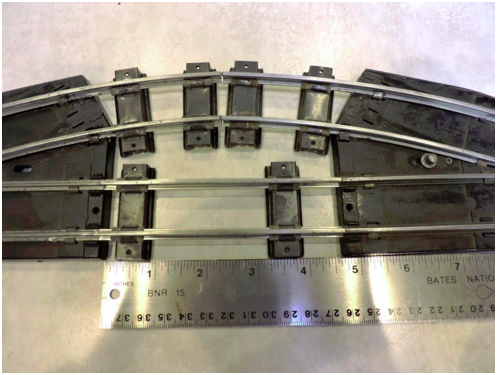 A friend sent me info detailing to an extent how to reduce AF parallel track centers to 2.5". Some surgery on the switch is required for some of the applications. Others require only a little creative "rail re-orientation". Mark, a very nice writeup and pictures, thanks for posting this. I also modified some turnouts by reversing the rails as shown here to get some yard tracks on 2.5" centers. Between every pair of close tracks I left a larger gap so I could put the remote uncouplers on all the sidings. Just a caution, using a 2'5" center to center spacing on mainline tracks with 20" radius curves will limit what engines and cars can be run without hitting each other on the curves. Mark, the modified turnout will definitely allow longer cars to operate without hitting the lantern housing. Connecting a curve track will create a double S curve. It should not cause a problem for original Gilbert equipment but the newer AM passenger cars may not like it. I wish that this had been posted a few years back! Looks like another project on my list, this one may have to move towards the front. I could sure use more yard tracks. Would it be possible for you to mark on these pictures where the rails were cut, that would help this old guy. Thank you, the picture as you posted it with the arrows is a great help. Mark's cut mark on the divergent rail is in the correct place. Rather than fool with mounting short pieces of rail on the turnout I just cut a piece of curve track to the correct length to go from the frog to meet up with the parallel straight track as one piece. I also did his switch 14A configuration with the straight rails. I did not cut the plastic base and glue them together, too much work at the time. At one of the DuPage shows in the early 90's I came across a guy selling American Flyer compatible Right of Way Industries #4 and #6 turnouts. They were built with wood ties and GarGraves rail and have the closed frog with the movable point like the current FasTrack turnouts. I bought a stack of #4's and used them rather than cut up any more Gilbert turnouts. Mark, it sounds like a complete success! I would assume the original metal slug with the triangular tip that holds the points in position will have to be removed to use a Tortoise machine. They would not be necessary any longer. Look forward to pictures of the installed turnouts with the freight cars on the mainline and passing siding. 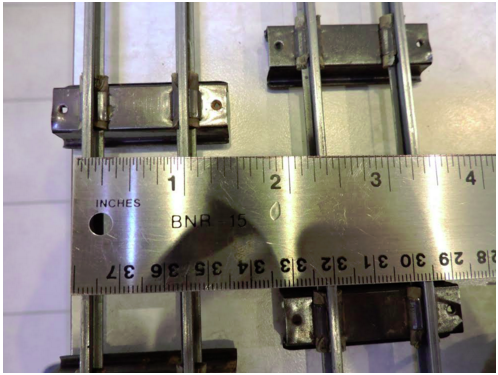 If you are contemplating a layout using Gilbert tubular track and turnouts or just Gilbert turnouts with another brand of track this modification will allow closer track spacing. That is a big plus when you are constructing a freight yard. More track means more trains on the table to run! Take a pair of Gilbert turnouts and decide how you want them to operate. If you are using the factory installed connections and operation that's OK as these modifications will allow you to maintain the one or two train operation Gilbert provided. If you are planning to use Tortoise switch machines you can use a pair of manual turnouts as the factory installed "guts" will be removed. The throw rod on the tortoise switch machine will operate the moving points to allow the switch to change to the curve route. I used two manual turnouts since I don't need the lantern tower or any electrical connections for replacement of the poorly operating Gargraves turnouts on my club's modular layout. 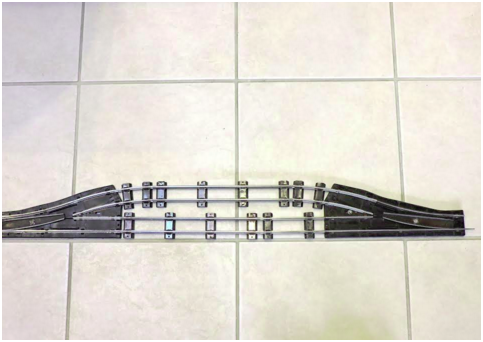 This picture shows a left and right manual turnout completely modified with divergent curved rails cut from a donor Gilbert curve. Cut and remove both the short curved rail and the newly cut short section of the long curved rail. Leave the 6.25" portion. To remove the rails you will need to remove the rail clips that attach the rails to the base. Save them as they will be reused. You may have to de-solder some wires from the underside of the clips. 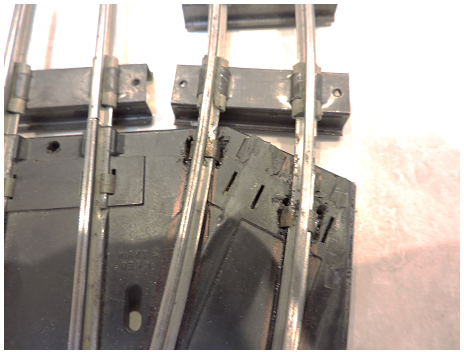 Take note of what wire goes where as they will need to be re-soldered to the tabs when the new rails are installed. The new rails are cut from a donor curve section. What we are doing is reversing the divergent curved route to not curve to the right anymore but rather make a gentle "S" curve so that we can attach parallel tracks closer together. The pair of rails on the divergent route will now measure 12.5 inches end to end. Remember to grind down the end of the inner curved rail to match the one discarded. The new location of the rails is shown below. You can see that the inner curved rail now just clears the point of the angle molded on the switch base. 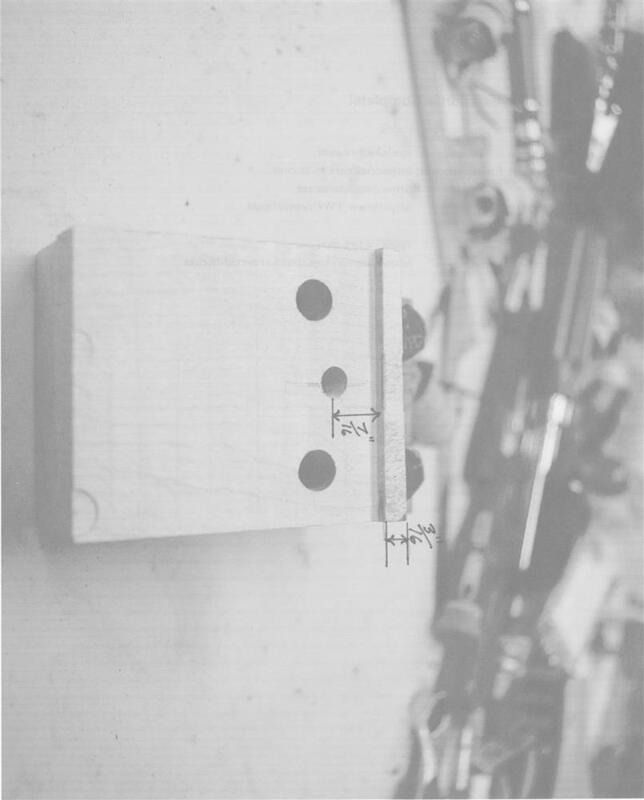 The "old" clip slots are visible. Drill new slots for the rail clips where ever you can find a space to do so and reattach them. You may have to grind off some plastic under the base if it's in your way. Re-solder any wires where they need to go. Slide two metal ties to the free end of the rails and secure them to the rails. Now your turnout's divergent rails are ready to accept straight sections. One more thing you will need to do is cut a "filler" straight section from a donor straight track to a length of 4 and 5/8 inches. Finally here's the turnouts with some straight sections installed along with the filler. Note I have cut away most of the base along with the lantern towers. They now resemble Gargraves turnouts and could be given a ballasted effect with some "Stone Effect" paint if desired. I closed up the newly cut edge of the base with a length of 5/16" wide black styrene attached with hot glue. The center-to-center spacing is now 2.25 inches. This project takes a little time but after the learning curve of the first one it's not too bad. Give it a try if you want to create a multi-track yard with close track spacing or even if you just want your passing sidings to not take up so much layout space. Mark! Do you realize how many projects you are adding to my list? Just a little kidding but this one has got to move to the top of the list, it will almost double storage. Thank you for all the info on these mods. Mark, I have acquired several of the Flyer turnouts and have begun to modify them using the ideas you have planted in my empty head. I have found a way to use the original Gilbert switch motors under the switches. I will explain this procedure and illustrate with pics. I would also like to take some pics before I do the mods on the layout to show the difference these switches make in the track-work. Thank you again for this thread that you have posted. The reverse loop circuit boards I used are PSX-AR-AC. The main advantages are they work for any track configuration and they do not rely on turnout position. The disadvantage is they are expensive. The solution Ray posted is a fine alternative and much cheaper. It might be a bit more complex for the wye. Ray, I look forward to the pictures. Mark, you are correct! That is what happens when posting quickly from a hotel room and the wife is in a hurry to leave for the dinner reservation! I need to double check prior to clicking the Post Reply tab. I will try to post some pics and explain my process for using the original motors in the Gilbert turnouts. The light shutter is removed and the coil is removed and installed on the bottom side of its base. I marked the position of the of the plunger lock on the plunger plate, before taking it off to bend the plunger plate, so I could reinstall in the original position. When the turnout is reassembled it operates as the original turnout did, but now the motor is under the turnout and out of sight. Of course you need now to cut a hole in the layout to clear for the motor. Very clever and the neat bends and reassembly make it look factory quality. Mark, I had a Tortoise here and did try it but, having the contact piece on the throw, the Tortoise would not operate the switch points, to much drag. I wanted to leave the contact piece on the plunger bar, I believe I can use that piece to operate the lights along side the track to indicate the routing of the turnout. I also found on some of the turnouts when remounting the motor I will have to use a nut on the mounting screws, some of the original tapped holes were pretty worn but I can camouflage the nuts with body filler and paint. Ray, the tortoise has two sets of contacts builtin so you could ditch the turnout contacts.. Sorry if you knew that already. Brendan, thanks for the info, I did not know about the contacts but at the same time I considered that I will be doing 20 or so turnouts and by using the original motors I can save a couple hundred dollars by investing a little time. Mark, Thanks for the videos, I would not say that your traversing those turnouts is slow, moderate speed yes. Hey those Marx bridges are cool, I have two on my home layout but only with single tracks. I did do some trial runs through my first set of modified turnouts using a number of locomotives, from a Flyonel GP to a Flyonel Challenger, and rolling stock from a few freight cars to an AM streamliner coach. All went through without a hitch at a number of different speeds. Mark, I did make a fixture for bending the actuator arm, I can post a picture if you want with dimensions. I made it out of hard maple because I am also a woodworker. Sorry that it has been a while before I got back to this. The first thing I did with the Jig was to cut three pieces of the hard maple, two pieecs the same length and the third piece 1/4" shorter. I laminated the two of the longer pieces and when cured I milled the step to the size shown, 1/8" high x 3/16" wide. At this time I drilled the hole in the laminated pieces for clearance of the plunger. I than put a piece of .030" styrene against the step on the laminated piece and fastened the third piece to it with double sided tape. I then drilled thru the clearance hole in the laminates, as a guide, and thru the short piece. I then drilled two holes thru all of the pieces for some 3/8" capscrews, drill these just large enough for the bolts to fit thru them, than on the back side of the laminated piece I opened the two holes just large enough to accept T-nuts. I needed to put wax on the capscrews to make it easier to turn them in, after doing a few of the actuators the screws tuned rather freely but were not at all sloppy. I should mention that after doing each bend I did follow it up by finishing the bend on my arbor press to make it tight as possible..
Mark, I thought I might bring this thread back to life for a bit. Now that I have begun to revamp my layout with these improved turnouts I found that my Gilbert uncouplers no longer fit, this being a problem because my desire is to operate as well as run trains. 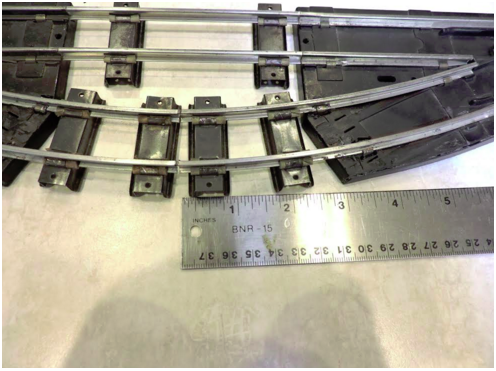 I disassembled several of the remote units and found that by cutting the top layer of the uncoupler and carefully bending the sheet metal parts and that by cutting more holes in the layout these will also work with the closer track centers. Mark, I am in total agreement with you on not getting to close with the track centers, especially on the mainline. I have some big steam power and using the Gilbert track with the rubber roadbed 2.5" is as close as is possible in the yards. On the main with the tight radius of the Gilbert track I keep somewhere over 3 1/4 centers, but even that is much tighter than the 5 1/4 required with the stock turnouts. I will get some pictures and hopefully some videos if and when I can at least get ruining again. I wanted to resurrect this thread to find if I might get permission to post the PDF from David on another web sight. This information is to good to keep to ourselves. I would post it in total along with the information on my modifications to the Gilbert throws. I will not do this without permission from you and or your friend. I have contacted David and will await his reply. Thank you again for posting this procedure, I love the results, one of the best ideas on my layout. "I agree!! I though I could not get anymore switches on my layout. I tried surgery on one and it turned out great. Now I need more switches......"
You mention that you need more switches in your post, I have a number of extra switches. Are you interested in doing the conversion using the original Gilbert motors or would you do the Tortoise conversion? I have quite an abundance of the older style Gilbert switches but I know that using their motors would not work very well. I have not received a reply from David so I will just post a link to the OGR thread that you had started here. I had mentioned earlier on this thread that I would post some photos. This is still a work in progress, 36 Gilbert switches now modified with most of them reinstalled. I still need to do repair of the scenery but finally done with switch mods. All of these switches have the Gilbert motors mounted to them. I now have room on the layout for roadway in front of the backdrop and the closer spacing of track at the turnout makes for better visual effect. I also now have space for the depot and terminal that other club members suggested I needed seeing that I love the stream-liners. All in all I am very happy with the results and want to thank Dave, Mark and Tom for your input on this project. That looks fantastic Ray. You sure did a lot of work to modify that many turnouts and re-lay that much track. Yes it was a good deal of work to get them modified but it was/is rewarding the way the layouts appearance has improved plus the space it freed up. As I stated most are reinstalled, the switches on the back side of the layout are on the grade and upper level of the layout and a little more difficult to fit and rewire. Once the track work is completed I will repair the scenery and then move on to add to the scenic effect. I want to get the track work completed though so we might be able to have a play trains/operating session with some of the club members. Hi, The new layout has started and I plan to modify some switches per this thread. Anyone have any suggestions for cutting the motor housing and excess material off AF switches? I cut the plastic with my band saw but if you have a scroll saw that should also work, if nothing else try a coping saw, it will take longer but use what you have. I need to mention remove the metal parts before cutting. Ray, that picture of the station and train shed is especially enlightening. The previous track locations are visible behind the station. The extensive turnout mods you did obviously make a major difference in your layout! 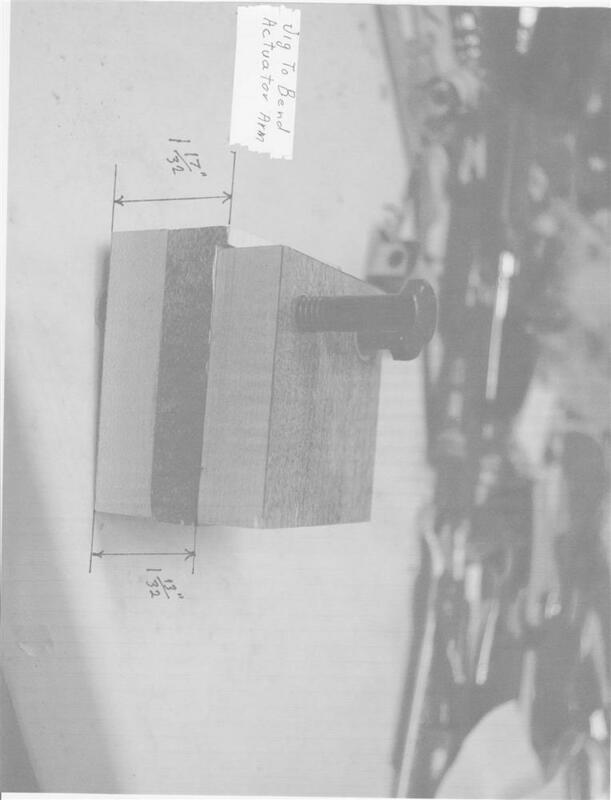 Also, we now know where all the rubber roadbed went, it is on your layout! I was blessed to have a major American Flyer dealer in the area. When he bought some collections he would sometimes get large quantities of the roadbed and I was able to buy large quantities and hold it till l built the layout. Once the track was down l found there was more than I could use and it was sold.